Native Access Error Message: "Installation has been prevented. You do not have enough free drive space to install the products." Native Access Error Message: Download Failed: "Unknown error"
Native Access Error Message: "Activation failed...Internal error during activation"
Note: The Native Access repair function is available on Mac OS X 10.11 (or higher) and Windows 7 (or higher). The software has been moved to a different location on your computer. The hard drive containing the software has been renamed. Navigate to the new location of the missing item's folder and confirm your selection. After you relocated all missing items, click the RELOCATE button to finish the procedure. 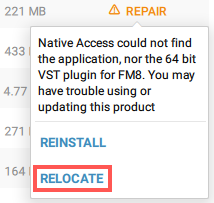 If you have moved multiple KONTAKT libraries, REAKTOR instruments or Expansions to another location on your computer, Native Access will show a RELOCATE ALL button along with the Repair notification. Click the user icon in the upper right of Native Access to open the Preferences and make sure that the File locations are set correctly. 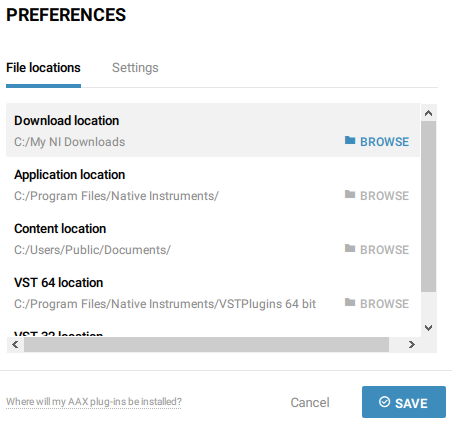 You can find more information about how to change install locations in this article. Update Installer Error Message: "Installation folder not found!"